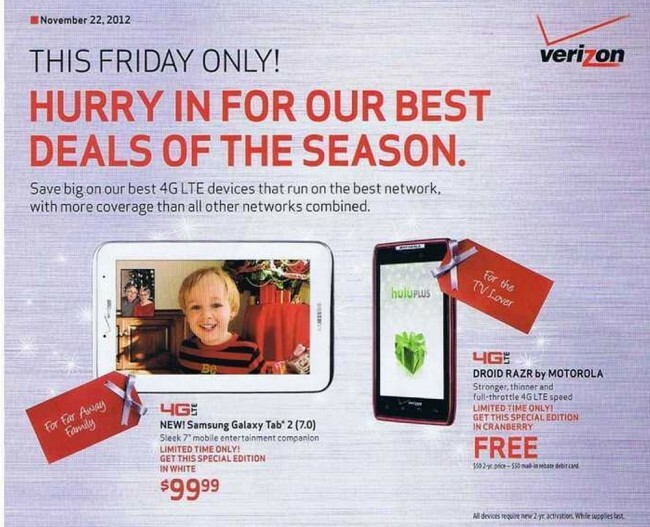 Verizon’s Black Friday ad is out and includes a couple of decent deals. First, as you can see in the image above, Verizon and Motorola are releasing a special edition “cranberry” color for the original DROID RAZR. No, this is not the new RAZR HD, but the same RAZR that was released a year ago. As you may recall, they did something similar last year with the Incredible 2, so this could be a new trend from Big Red. But speaking of the “cranberry” RAZR, it’s free, along with the Galaxy Nexus and LG Lucid (with a new 2-year contract). The Galaxy Tab 2 (7.0) is $99, however, we thought Verizon had done away with contracts on tablets, so we are a big confused at this price. You will also find some decent accessory deals this Friday, including a Jambox for 50% off (after you buy a new phone). Oh, the DROID DNA also made an appearance as it goes on sale Wednesday.